Teacher: Welcome class to the lesson on Essential Guitar Techniques. This lesson will feature both fret and palm muting. This is a very important technique to develop and incorporate into your playing. Adding muting to your playing can give you sound more character and make it sound more interesting. It is challenging to play at times, however these exercises should help. Teacher: Let's get started. Here's the first basic technique example of "Fret Muting." Teacher: In this example you lay your 3rd finger slightly on the 7th fret. This adds the muted sound as well as a slight harmonic if you might notice. 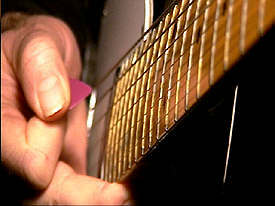 Here's a picture of the technique, remember note to press the strings all the way to the fret. 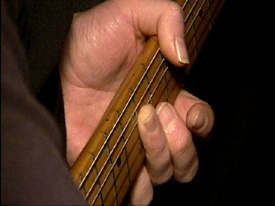 Teacher: Muting using the fret hand also creates a harmonic as well, as I mentioned before. 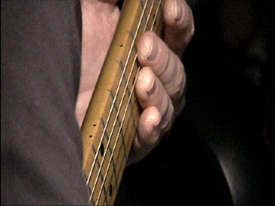 Muting can sound different, depending on the fret position you lay you fingers. dh: I noticed both the high and low E strings are not muted is there a reason for that? Teacher: DH, you can include the low E-string if you want, I'll get into that later in the lesson. Here's the next example. Teacher: Notice the harmonic variations as I move up the fretboard, this correlates with the harmonics on the 3rd, 5th, 7th, 9th and 12th frets. You can produce a musical sound using only muted notes as you might have noticed. Try practicing various combinations. Here's the next basic example and then we will get into playing riffs. Teacher: In this example I play single notes, notice the harmonic overtones as well. Here's the next basic example. Teacher: Same technique, but notice how playing the notes in the A Minor Pentatonic scale sound different from actually fretting the notes. Notice the 5th frets sound higher than the 7th fret notes. Here's the next example. Teacher: Now DH was asking earlier about muting the 6th string, in this case you barre the 5th fret notes and mute the 5th fret/6th string with your thumb. Here's a picture of this technique. Teacher: Joel, yes! I'm sure you'll notice all kinds of comparisons in many styles of music. You might look at playing the guitar like a percussion instrument. Muting really allows the syncopated notes to stand out. Another practice I do and suggest to all of you is to practice like you are a drummer and try playing various rhythms, even along with a drummer on a recording or to a drum machine. Use all muted notes and focus only on developing you rhythm skills. This is something you can do watching TV or listening to the stereo as well. Here's the next example. Teacher: Now in this exercise you practice playing regular fretted notes, and then lifting slightly to play muted notes. This is an excellent exercise. Here's the next example. Teacher: This exercise uses the A barre chord where you play the lower notes on the 5th & 6th strings, and use the higher notes to mute and create a percussive sound. OK, let's apply some of these examples to some riffs. Here's the first riff. Teacher: In this example you simulate the sound of an automatic gun. You start by barring the the D and mute by slightly lifting your fret fingers, and then shift to play the lick in between the muted notes. Make sure you alternate pick. Here's another Hendrix style riff you can try. Teacher: In this example you mute the barre 9th frets and play a rhythmic pattern. You can also use a Wah or Envelop Filter pedal to get the unique phasing. See how important the strumming hand is while you mute the notes. Here are a few funk examples. Teacher: In this funk example notice how the muted portions of the phrase adds more percussion. You should work on altering combinations of muted chords. Here's the next funk example. Teacher: Notice the muted notes on the 6th string using your thumb. Notice how the syncopation is accented more with the added muted notes as well. Now we will cover palm muting using your picking hand. Here's the first basic technique. Teacher: In this example you play the A Mixolydian scale, first regular, the next bar palm muted. The palm muting makes the notes sound staccato. Here's an image of you picking hand position. Teacher: For some of you it might take some adjusting to get use to resting your palm on the strings. Try practicing you scales using this technique. Here's another example. sammy_andrews: Is it ok to rest your palm just in front of the bridge? Teacher: Sure Sammy, experiment using different positions to see what works best for you and see how the sound can vary. I palm mute on the acoustic just over the bridge, that seems to be the most comfortable position for me. Here's the next example. Teacher: In this example you play an ascending, and descending chromatic scale, once using standard picking, the next using palm muting. Palm muting while playing fast can sound awesome. Al DiMeola is a master at this technique. Here's an exercise you can try using alternate picking and palm muting. Teacher: This is a very cool combination to develop. Try practicing using chromatic scales at first, and then playing diatonic scales like the A Minor, A Major, etc. using this technique. Teacher: Well, time to go. See you next lesson! sammy_andrews: ok...thanks, see ya next week!